Authenticity means being real and being true to the self. It means that you don't make up things and every word that you utter comes right from the bottom of your heart. 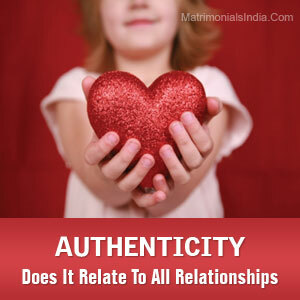 Authenticity simply means that you are honest and unquestionably, it can be related to all the relationships. Authenticity is the key to happy and healthy relationships. Unless you are true to yourself, you can't be happy in a relationship. The irony is many people spend their entire lives never ever realizing their authentic self. People in fact fail to realize that by being unauthentic they make their relationships worse. Authenticity needs deliberation regarding how your commitments can contribute to shaping a good relationship. Authenticity is about being genuine. Being genuine is simply being honest to all the commitments that you make in a relationship. It requires you to stand for what is actually real and not what you consider as real. Often people get tempted to be fake because of their desire to either feel or to look smarter and better than others. This temptation is nothing but the ego that makes you fake and requires you to exert misguided energy which of course is difficult. Being authentic is rather easy, but to be so you need to come out of the pretences. Authenticity means that you have a perfect balance of trust and belief in your relationships. It involves that you truly care about your partner and are sensitive about the phases that you go through. Authenticity means that all that you speak, all that you mean and all that you do are correlated with a perfect balance of trust and belief. Being authentic in a relationship means that you are living with integrity and aim at the joys of life with a calm heart! Once you authentically are in a relationship, you need not to show that you are perfect. After all, no one out there in the world is perfect. Be the real you and cherish all your relationships to the fullest.